Often, the excellence of an achievement depends on the capacity of a product to perform its function. More it is targeted more it succeeds. For example : the largest show in the world of Scandinavia furniture and lighting : the 63rd edition of “Stockholm Furniture & Light Fair” to be held from 4 to 8 February 2014 with 750 exhibitors and 40,000 visitors expected . You can “preview“ some items in this issue. This show has the ability to enhance every year its brand image with new projects e.g, this year the forum for discussion and exchange on furniture and interior design: the “Stockholm Design Talks“.The conceptual skills of Design Schools and Studios operating worldwide are represented, designers meetings, product presentations (80 % of exhibitors are Scandinavian ) between tradition and trend, altogether in a warm atmosphere. The organizational skills of the operator make this a must- tradeshow. We will bring you images of new products, see our international E2D “webzine” ( Workplace Ergonomics, Design and Dynamics) . 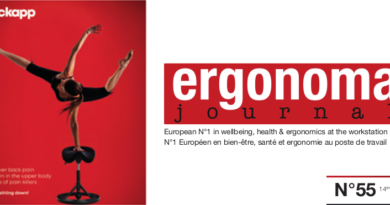 The first 2014 Ergonoma Journal has a renewed “grip”, with a 24 pages France edition – 8 more than previous editions-, topics associated with case “studies” in all sectors, to improve working conditions and to improve the ergonomics at workstations. You will also find an expanded product index. Our wishes : to be done with the 13 from 2013 “Superstition, superstition when you hold us !” 2013 will ” fall ” in the archives of history in the lost time section. We make wishes for 2014 to be a Beautiful year, creative and returning to a double-digit growth.